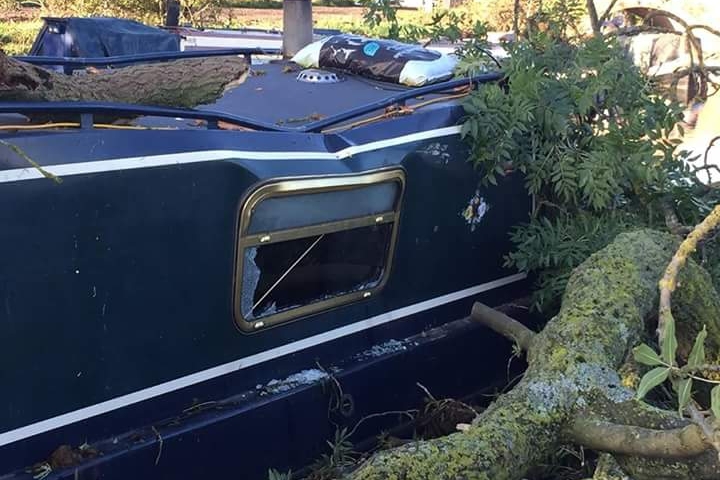 My disabled sister Liz and her husband, who live on their narrowboat at Clifton upon Dunsmore near Rugby, were about to go to sleep two nights ago when a four tonne tree came crashing down onto their boat in the strong winds of storm Bronagh - you may have seen it on the national and local tv news the following day. The weight of the tree caused the boat to list heavily and start taking in water, luckily she, her husband and the boats cat did not suffer any physical injuries however serious damage was caused to the boat - initial estimates are £30k plus. This boat is their full time home. Unfortunately there will be many shortfalls in what their insurance covers due to policy excesses and limitations for things such as alternative accommodation costs during repairs as well as increased expenses whilst they await the repairs on their home which are anticipated to take 2 to 3 months due to the amount work needed. The storage shed for my sisters mobilty scooter was destroyed along with some personal belongings that will not be fully covered, and it is for these unplanned costs that I am starting this campaign. Give much as you can afford...Thank you all. Today in the morning Liz is at hospital and the Insurance surveyor is due this afternoon to look at damage.